The CentiareWire is a quarterly newsletter issued to all Centiare Users who have registered and confirmed an e-mail address. Centiare is getting a good amount of traffic for a site that's been open to the public for only four months. We're especially proud of the fact that we average 7.0 page views per visitor. That means our look, feel, and content are engaging visitors! It's not YouTube traffic. It's not MySpace traffic. But, in terms of page views, we're already consistently beating other media sites that have been around for years and years. Gazette.com - the primary newspaper of Colorado Springs, CO (a metro area with population of 587,500). 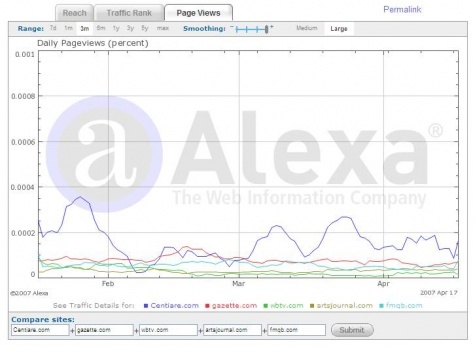 While Centiare may trail them in raw visitors, we dominate each of them in total page views. For the first quarter of 2007, Centiare recorded nearly 14,000 visits and over 96,000 page views, according to Google Analytics. Returning visitors make up 25% of the traffic. The top inbound sources of traffic are Google search results, followed by message boards and blogs where we're mentioned. We serve about 60 to 80 megabytes of data per day. Thanks for the interest, but I maintain my own website and would not be interested in your services. I completely understand your line of thinking from a "brand unity" perspective. But, if I may be so bold, I believe it is misguided. Centiare does not strive to "become" or "replace" your own website (even though in the case of Liz Cohen, who didn't really have her own page anywhere yet, it did sort of become a de facto homepage). We seek to be a complementary source of "one click away from your website" traffic. In other words, just because you have your own website, would you refuse to be listed in the Yellow Pages? Would you dispose of the idea of having a MySpace page? If you had an ad campaign running on the radio, would you refuse to accept an offer elsewhere for free television advertising? Since Centiare is free to use, the only thing you have to "lose" is some time and effort to get your page set up and looking at least as decent as a "stub" on Wikipedia. However, if someone is searching Google for: "San Luis Obispo" large format printers, they will get over 100,000 results on Google. The BIG Images web domain doesn't show up in the Top 20 results (it happens to be 21st), but the Centiare page shows up 4th! Someone clicking on that link then has all the information they need to call or e-mail the print shop, or to click one more time to get to the BIG-images.com page itself. Why would anyone say, "Well, I have my own web page, and if it comes up 21st in some searches, I'll just have to live with that. I don't want a link that comes up 4th, if it's not to my home page."? Sorry to sound like a sales pitch, but (as I said), what I'm "selling" is free. What are your thoughts about this? I know for a fact that the majority of the registered users of Centiare have not made a single edit on the site. Are they, like our artist friend above, hesitant to dilute their "own website" by linking to it from here? I just don't get it, but comments are certainly welcome on my Talk page. This page was last modified on 26 December 2007, at 20:01.